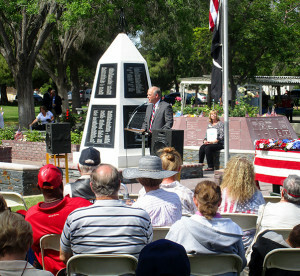 Monday as we gathered for another Memorial Day remembrance at the oldest established cemetery in the Antelope Valley, I could not help but think of the generations who stood at these same grounds and reflected back on the lives lost in service to our country. I wondered what it would have looked like and what was said. As an historian you always try to put yourself in the shoes of generations before and look for the symbolism with a new twist to share and inspire. To those who awoke early on Monday they did not realize that as they sat in the audience they would become a part of a silent story that had its ending on April 8, 1908. Sgt. 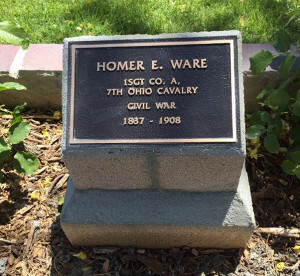 Homer E. Ware, a Cavalryman with the 7th Ohio Calvary Regiment, served under the command of William Sherman and George Thomas during the Civil War. From the humble beginnings of a private he rose to the rank of lieutenant with a battle field commission, ending up being discharged as a first sergeant. The veteran of about two dozen major conflicts as a member of what was called the River Brigade, he served our country with honor giving his all on the battlefields on American soil. Many times as we attend programs we are just an audience, but in the case of Sergeant Ware we became the funeral he never had. Unknown for more than a century, the Cemetery staff just recently discovered that Ware was buried in Lancaster Cemetery in an unmarked grave as he died in Lancaster only 11 days after his arrival. No family or friends, no military honors, not even a record of a pastor giving a prayer or final rites, no headstone. But on May 29, 2017, as a plaque was unveiled in the Veterans Court of Honor he was invisible no more and the soldier that disappeared in the landscape of the cemetery’s history was now given a proper remembrance by a grateful nation. As we all spoke his name, he was gone no more, he now lives in our conscience. The key note speaker, a man that was the perfect fit for the program and the day, was retired Col. Evan Thomas, a veteran and Air Force combat and test Pilot who gave his heartfelt personal experiences as a commander of men and women and as a soldier of the air. Not speaking of himself, his stories reflected the service and sacrifice of those that served with him and their dedication to the military oath that all service men and women take upon enlistment. A code of honor that transcends self and reflects the very best of the American fighting man and women. 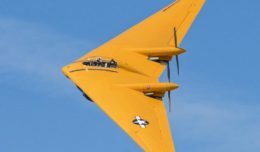 At one point holding back tears and with a small crack in his voice, the respect and personal admiration he had for his fellow airmen became evident to all and for that one moment as he spoke of their supreme sacrifice we realized how blessed we are in America to have such unselfish individuals that give so much in the defense of our ideals and our freedoms. I’ve been to many events over the years and you know the message of a key note speaker really hits home in the heart by the way people react to the speaker. It’s been a long time since I’ve seen a standing ovation last that long and that heartfelt by the public. Col. Evan Thomas, doing what he does best, inspiring us all to be the best we can be and never forget the sacrifices of the men and women that stepped up on our behalf and has done so for generations. Wrapping this up I would like to say the standard footprint of a Memorial Day program never goes unnoticed and never gets tired or old. Watching the Antelope Valley Young Marines take care of the flag honors, we understand the importance of passing on our nation’s sacred traditions. Many years from now, they will pass on the legacy of traditions to our nation and their children and friends. 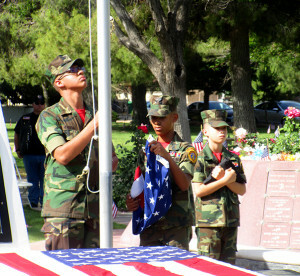 From the National Anthem to the playing of “Taps” to the bell ceremony, the traditions carry on. Next year we will gather again on the hallowed grounds of cemeteries across America and around the world and refresh and reset the understanding of why America is the special place it is that we all call home.